Although it is still a few weeks away, it’s probably time to start thinking about the 2018 Northeast Mississippi Walk to End Alzheimer’s. Organized by the Alzheimer’s Association, it is scheduled for Saturday, October 27, at Ballard Park. Onsite registration begins at 8 a.m. but pre-registering for individuals and teams is open now. The length of the walk is 2.75 miles. “We expect to sign up all 15 employees,” said Nikita Barton, office administrator for Bankers Life & Colonial Penn Tupelo’s branch office, as she picked up her team packet last week at the Renasant Center for IDEAS. “This is our first time to do this in Tupelo. Our company as a whole has been supporting the Alzheimer’s Association at least five years.” Nationwide, Barton said, Bankers Life & Colonial Penn has raised more than $1.5 million for the support organization. “You are like a dream captain,” Rachel Corkern, director of development and corporate engagement for the Mississippi chapter of AA, as she handed Barton her team packet. Alzheimer’s Disease is a progressive disease that destroys memory and other important mental functions. Brain cell connections and the cells themselves degenerate and die, eventually destroying memory and other important mental functions. Memory loss and confusion are the main symptoms. No cure exists, but medications and management strategies may temporarily improve symptoms. According to the Alzheimer’s Association, 54,000 people age 65 and older in Mississippi have the disease; that number is expected to increase to 65,000 by 2025. Further, the association estimates there are more than 5 million Americans living with Alzheimer’s. The cost of caring for those patients – and others with various forms of dementia – is estimated to total $277 billion this year. Nearly one in three senior citizens who dies each year has Alzheimer’s or another type of dementia. Alzheimer's worsens over time. Alzheimer’s is a progressive disease, where dementia symptoms gradually worsen over a number of years. In its early stages, memory loss is mild, but with late-stage Alzheimer’s, individuals lose the ability to carry on a conversation and respond to their environment. Alzheimer’s is the sixth leading cause of death in the United States. Those with Alzheimer’s live an average of eight years after their symptoms become noticeable to others, but survival can range from four to 20 years, depending on age and other health conditions. Corkern said the organization’s goal for the Tupelo walk is 300 participants: “Our goal is to raise $100 per person,” she said, adding that there is no cost to register a team. The $100 target earns participants an event t-shirt. “This is one of about 600 events nationwide,” said Corkern. 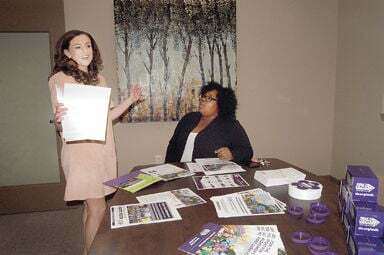 “It’s the largest fundraising event in the world to raise Alzheimer’s funds.” The local walk raised $173,921 last year; this year’s goal is $300,500. Proceeds go to patient care, patient support and research. Corkern lost her grandfather nine months ago to Alzheimer’s, while her grandmother died a year ago from the disease: “I am working for the association for what they were going through,” she said. Likewise, Corkern’s association coworker, Cindy Widdig, AA director of community education, lost her grandmother to Alzheimer’s 13 years ago: “She had it 10 years and lived with me the last two years,” said Widdig. She added that she has been with AA for two years and wishes “I had known” about the organization back then. There are 35 Alzheimer’s support groups throughout Mississippi that meet regularly. To find their locations and when they gather, go to www.alz.org. To find out more about the walk, go to www.alz.org/walk or call the Jackson office at 769-230-0611 or 800-272-3900.